This Teriyaki Chicken may not be very traditional but I cooked it with ingredients I had at home. It is easy to make, with low calories but with so much flavour coming from the orange glaze. The last time I made Chicken Teriyaki was three years ago. Back then I made it with mushrooms and may be it wasn’t as authentic as it should be but it was delicious. In that recipe I did not use sake or mirin, nor did I use it in this recipe as well, because to tell you the truth, I didn’t want to spend money on drinks that will wait in the cupboard for maybe another three years until I cook this dish again. The last time I used sherry but as I did not have any of that as well, after google searching “What does sake taste like”, I decided to use the only wine I had and sweetened it with orange and petimezi (concentrated grape juice) to balance the taste. I love petimezi but I only used a small amount because it is very sweet and I did not want to add too many calories. If you don’t have petimezi, you can use any other molasses you like or use honey, brown sugar and why not maple syrup. This is another winner recipe as it has a wonderful flavour, it’s cheap, low in calories, it can be prepared in less than half an hour and with ingredients I have in my pantry. Wash and pat dry the chicken breast and cut it into 1 cm pieces. Put it in a bowl, add all the marinade ingredients and marinate for at least three hours. Brush a non-stick sautéing pan with half of the olive oil put on the heat. Add half of the chicken and sauté on both sides. Add the other tbsp olive oil and sauté the remaining chicken. Remove the chicken to a platter, add the garlic and sauté it for a few seconds until fragrant. Put the chicken back in the sautéing pan, season with salt and pepper and add the marinade. Lower the heat, cover the pan and cook it for 10 minutes, until tender. Serve with rice pilaf and a salad. Note: If you want to make your sauce thicker and shiny, dissolve 1 tablespoon corn starch in ½ cup chicken stock and mix until the sauce thickens. In this recipe I did not add the corn starch and chicken broth because as I am still on a diet, I didn’t want it to have too much sauce. In this recipe I did not add the corn starch and chicken broth because as I am still on a diet, I didn't want it to have too much sauce. That dish looks really delicious! Healthy and very flavorful. I love teriyaki chicen and this looks so so good. Please take advantage of Commentluv Plugin and add any of your posts. You can add more readers to your blog. I love chicken teriyaki. What a great idea to add petimezi Ivy! Ivy, I love this recipe! I love both Teriyaki Chicken and Lemon Chicken so this must be fabulous! I do not cook with oranges as often as I should so I am interested to see what flavor it imparts to the chicken. And I love that you lighten your great recipes! As always, your good dishes. I’ve never used petimezi, but I’d love to try it. This dish sounds full of tangy flavors, light, and delicious! It’s been a long time since I made teriyaki chicken too Ivy! I love your version with the orange! And grape molasses – where have you been all my life? Omg, fabulous teriyaki chicken,just makes me drool.. I like the name “petimezi.” Your plate looks very inviting. I never tried ‘petimezi’ but it must taste really good! I have recently finished my third bottle of mirin in two months.. I have started to cook more Japanese recipes, and now that I got the hangs of it, found that it complements many traditional dishes very well. I agree that dry wine with a sweetener is a very reasonable substitution. Wow, the picture makes it look incredible. You can almost smell and taste how good it must be. Poulet/orange : un mélange des plus délicieux. 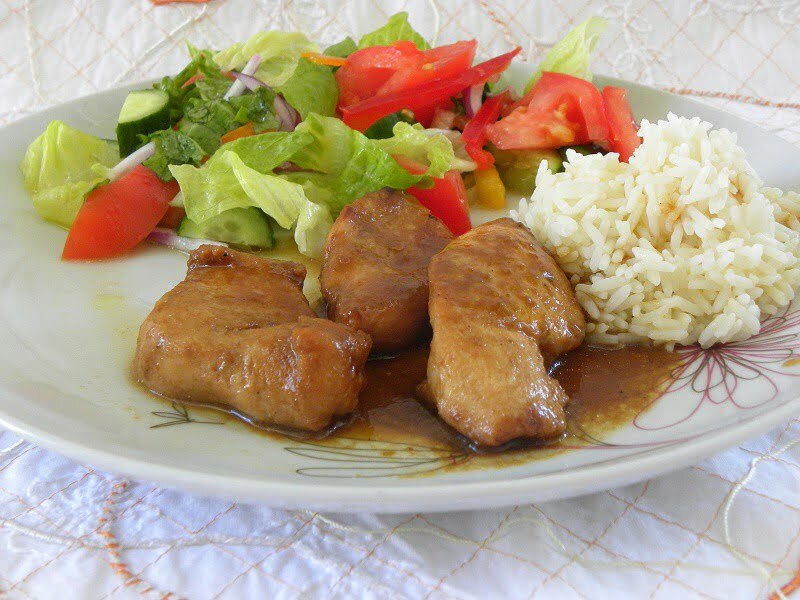 I love your way of teriyaki chicken, using orange is such great idea, love the tangy flavor. Hey Ivy! Love the simplicity of the ingredients and methods to this recipe. I think even Dimi would like this. I haven’t had teriyaki style chicken in years, thank you for sharing! That looks delicious Ivy..lovely recipe!! It looks delicious…..the marinade sounds amazing,Ivy! I think you did it in the properly manner.Also the recipe was delicious one.Thank you for sharing a new type of delicious recipe.It looks great from the picture and i will definitely try it in my kitchen. This Teriyaki Chicken looks tasty. I like the pictures that you have shared. Even I am trying my hand at cooking. I will try this out. Thanks for sharing. I think I should try this thing. I love cooking with chicken. I have no affection with porks LOL. Thanks for the menu. Omg, fabulous teriyaki chicken,just makes me drool.. You can almost smell and taste how good it must be. Great post! Wow, the picture makes it look incredible.I love chicken teriyaki. Thank you for sharing a new type of delicious recipe. I’m getting desperate with mouthwatering urge to eat this orange infused teriyaki chicken. I am always in love with teriyaki and always amazed tasting different recipe but I’ve never tried this with orange sauce. So this one’s new to me. Thank you for sharing this, will definitely give it a try.